As another part of my Sustainability Studies internship this semester at Seven Generations Ahead, I get the opportunity to participate in the Zero Waste Schools program. 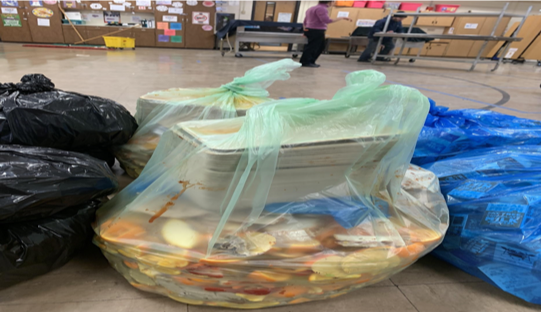 The program works with CPS schools and those in the greater Chicagoland area to limit the amount of waste generated in the lunchroom specifically. The initiative has several steps. First, Seven Generations Ahead reaches out to a school to see if they are interested in the program; or, in some cases, a school will see a neighboring school which has implemented the program and reach out to the Zero Waste Schools (ZWS) program for information. After communication has been initiated, ZWS representatives meet with the principals and lunch room coordinators to determine a good timeframe for implementation and assessment of the dynamics of the lunchroom (i.e Does the school utilize compostable trays? How many students purchase a lunch versus bring one from home?). After determining the logistics of how the implementation will work, ZWS representatives create a financial summary of how much composting service will cost the school as well as how much they will save on trash service. We attempt to be as specific as possible by including costs of the composting receptacle, the composting bags, and other materials or services. After the school receives this information, they can make a decision about whether or not this is a viable option for the school. If the school agrees to participate, a startup day is scheduled for ZWS representatives to implement the program. This is where the fun begins. I have been a participant in all of the steps of this process, but startup day is my favorite. 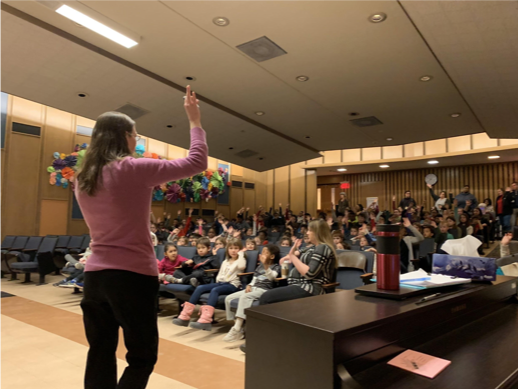 On the day that the school and the ZWS representatives planned, students attend an assembly where ZWS representatives teach students about the importance of recycling and compost in ensuring a sustainable future for Earth. At the end of the presentation, we show students how the new method of disposal will work based on four different bins (pictured below) based on four categories to limit contamination: liquids, recycling, landfill, and compost. To aid students in the placement of their leftovers, pictures and directions are placed on the signs. After the presentation, it’s lunchtime! Students file in with starry-eyed looks as the ZWS representatives wave and ask if they’re ready to save the planet today. After students finish their lunch, we assist students in sorting their trash utilizing the four bin method (which is typically a bit chaotic). As kids hold their half empty bottle of milk and empty lunchable we remind them to empty out all the liquid from their carton before placing it in the recycling bin and to check the number on the bottom of their container to make sure it can be recycled. Once the lunchroom madness ends, ZWS representatives tie up all of the bags and complete a waste audit to determine the schools diversion rate. (I was lucky to have experience with waste audits thanks to the awesome SUST 240 Waste class I took last semester at Roosevelt.) In our waste audits we both weigh the bags to determine the diversion rate as well as ensure that there isn’t contamination in the recycling and compost bags through sifting through and checking the bottom of the bags for liquid. The students typically do a great job of sorting their lunch leftovers, especially with the help of ZWS representatives and parent volunteers. After the waste audit has been completed, ZWS representatives pack up their supplies and get to work on creating a summary of how much compost collection will be necessary for the school and how much trash service the school can cut down on. 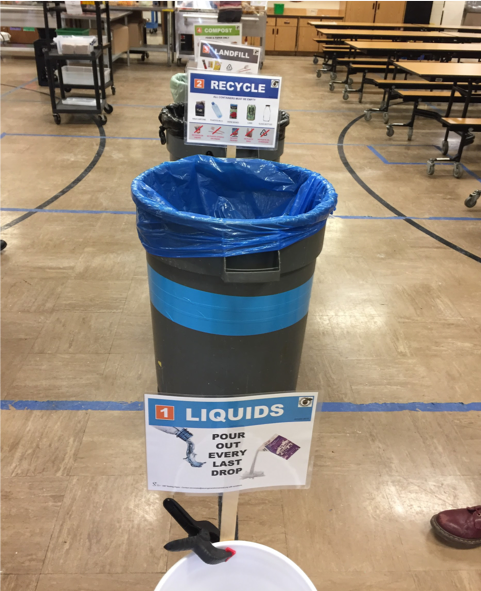 It is then up to the schools, either through parent volunteers or student monitoring, to ensure that the Zero Waste program is kept moving and grooving. The schools are encouraged to reach out to the program if they have any questions or concerns with the program and ZWS monitors their progress to ensure the program runs as smoothly as possible. Working with the Zero Waste Schools program has taught me a lot, not only about how to properly recycle, but also about how excited students can be about the program. Seeing kids who are confident in their recycling skills and helping their friends to properly sort their trash is incredibly uplifting and shows how a little education and motivation can create a more sustainable future. As the Zero Waste Schools program begins to expand, I think we will see a new generation of students with an even greater understanding and appreciation of the Earth they live on. And that makes all of the digging around in the trash more than worth it. Bria Jerome is a senior in Roosevelt University’s College of Arts and Sciences, where she is double-majoring in Sustainability Studies and Political Science. Bria is reporting this spring 2019 semester on her sustainability internship at Seven Generations Ahead in Oak Park IL, and will be presenting on her experiences at RU’s annual SUST Student Symposium on 5/1 (4pm, WB 1214 at Roosevelt’s Chicago Campus). 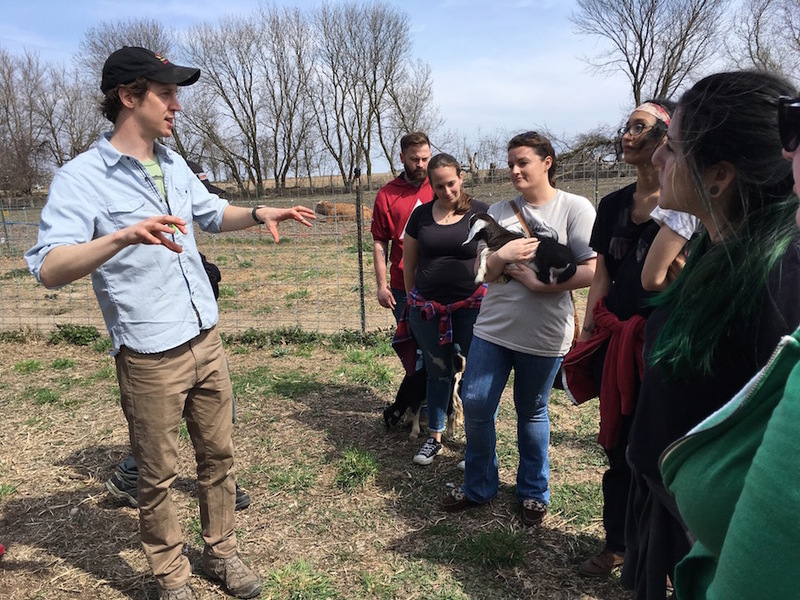 Sat 4/20 — Field Trip to Angelic Organics CSA Farm: Another outstanding field trip opportunity with SUST Prof Vicki Gerberich and students in her SUST 230 Food class, as they journey to this remarkable organic farm and learning center in northcentral IL. Two words: baby goats! Animal lovers will really dig this one. Open to students, faculty, staff, & alumni. Modest fee + road trip = well worth it. Details here! Wed 5/1 — SUST Student Symposium: An annual festival of student creativity and action research that features four team presentations by RU undergraduate students in Prof. Mike Bryson’s SUST 250 The Sustainable University class. Food. From 2-4pm in WB 1214, teams will describe their work on campus sustainability projects on food waste reduction in the Dining Center, recycling/composting in the WB Dormitory, rooftop gardening, solar energy generation, and water conservation. Free food. From 4-5pm we’ll feature 1-2 individual student presentations on their recent sustainability internship and research endeavors. Did I mention food above? [Quite possibly.] Yes, refreshments will be served! RSVP to Prof. Mike Bryson (mbryson@roosevelt.edu) to feed your brain AND your belly. Elevate Energy is a non-profit organization doing great work developing renewable energy and energy efficiency programs in Illinois. Unlike most profit-oriented companies, Elevate is focused on equity issues in sustainable development. Elevate Energy is looking to hire a Marketing Coordinator to assist with their roll-out of a new state program called Illinois Solar For All. Many recent grads will be good candidates for this position. 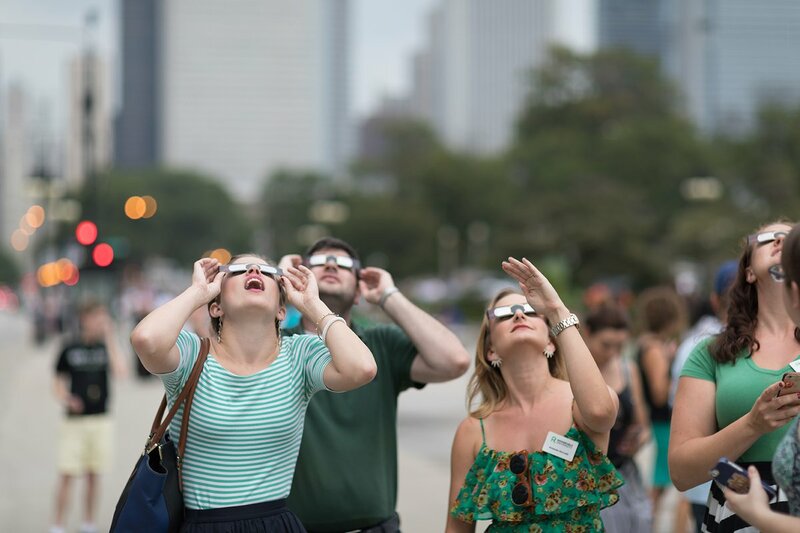 The responsibility of the Solar Marketing Coordinator is to increase participation in the organization’s administration of the Illinois Solar For All program. Primary tasks include developing and executing marketing plans, building strategic relationships, writing compelling content, testing new strategies, and finding opportunities to promote programs. Additionally, the coordinator will support other organizational marketing and outreach needs as they arise. The Marketing Coordinator reports to the Associate Director of Marketing and will work with other teams across Elevate Energy. Ahh, spring has finally arrived! And what better way to celebrate this season than by getting outside and gardening. 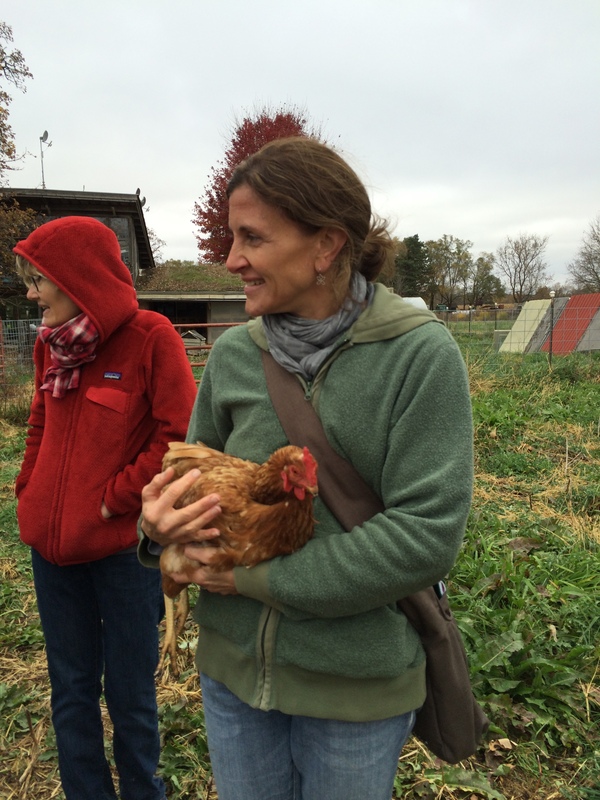 In honor or Earth Month, many special activities have been planned, including several garden and farm workdays and tours, arranged through the Sustainability Studies Program and Prof. Vicki Gerberich’s SUST 230 Food course. Even though these opportunities are geared towards food sustainability, they also play an important role in so much more, including community development, urban sustainability and social and environmental justice. Plus, gardening and getting outside can be a great stress reliever, especially as we approach the end of the semester! 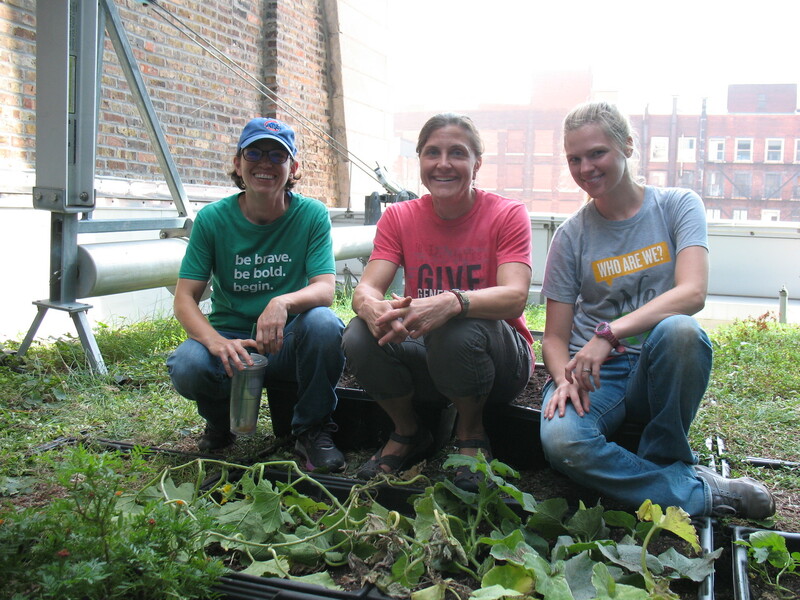 Washington Park Youth Farm with Windy City Harvest – Friday, April 19 (9:30am-12pm) or Friday, April 26 (9:30am-12pm). Washington Park Youth Farm is located at 555 E. 51st Street on Park District property adjacent to Walter H. Dyett High School in Chicago. Built in 2009, the farm currently has 73 raised beds, a 42-foot hoop house, two beehives, a small fruit orchard, native and perennial plantings, and community space for youth programming. Each season, 25 neighborhood high school students are hired to work on the farm from May through October. Students grow and harvest produce, learn about food systems and healthy eating, and cultivate job and life skills in a safe, supportive, and structured environment. The Washington Park Youth Farm is open to the public on farm stand market days. The on-site farm stand is open on Wednesdays, July through October, from 9 a.m. to 1 p.m.
Angelic Organics CSA Farm – Saturday, April 20. This will be an all day event, as the farm is located at 1547 Rockton Road, Caledonia, Illinois. Transportation to the farm — located about 75 minutes west of Schaumburg at 1547 Rockton Rd., Caledonia — will be either on your own or coordinated individually for carpooling. This is a really excellent opportunity to get an up-close and personal look at the workings of a local, family-owned, community-supported farm fostering a vibrant local food economy. Growing Home Farm Tour – Friday, April 26 at 1pm. The farm is located at 5814 S. Wood Street, Chicago, IL. Growing Home has been using urban agriculture as a catalyst for change for over a decade in Englewood, an underserved community on Chicago’s south side. Growing Home uses a combination of outdoor growing space and unheated hoop houses to extend their growing season, enabling harvests from March through December. The tour will last about an hour, but there may be an opportunity for an optional volunteer work opportunity to extend the timeframe by another hour. Recently, the Southeast Environmental Task Force started a petition to stop the relocation of a major polluter to Chicago’s Southeast Side in a blatant case of environmental classism. The polluter in question, open-air scrap metal facility General Iron, had announced plans to move there from their original location in Chicago’s wealthy Lincoln Park neighborhood due to Lincoln Park’s riverfront revitalization project. General Iron is the largest, open-air, scrap metal facility in the city of Chicago. The facility is going to be relocated from Lincoln Park to the Southeast Side because it is being forced out to accommodate for the Lincoln Yards riverfront revitalization project. This relocation of General Iron to the Southeast Side is a clear act of ENVIRONMENTAL CLASSISM, which refers to any practice that disproportionately affects communities of varying income classes in respect to environmental quality. Low income communities are often left to face the brunt of environmental injustice as they are treated as dumping grounds of polluting industry while affluent neighborhoods enjoy an environment free of toxic development. 1) HIGH VOLUME OF TRUCK TRAFFIC. General Iron is currently known to handle an average of 600 diesel trucks per day. The Southeast side already experiences an average of 189 diesel trucks traveling through any one intersection PER HOUR. These numbers don’t include the projection of trucks that will come from the new warehouses. Diesel truck traffic negatively impacts air quality and the safety of drivers and pedestrians. General Iron stated it would have most of it trucks travel through Torrence Avenue—where residents’ homes are already cracking from the abundant truck traffic. 2) THE SOUTHEAST SIDE IS ALREADY BURDENED BY ITS INDUSTRIAL CORRIDOR. Our industrial corridor is a danger to the community’s environmental health, public health, public services, and economic status. The quality of adjacent schools such as George Washington High School and George Washington Elementary School are also negatively impacted, and will be in close proximity to General Iron’s new site. The following map provides a visual of this and the disparities that further contribute to environmental classism. Why is it that affluent communities cannot share the burden? 4) A DANGER TO OUR NATURAL AREAS. The increased truck traffic being rerouted to Torrence Avenue will negatively impact visitors and wildlife in the adjacent natural areas such as Big Marsh and Hegewisch Marsh. 5) GENERAL IRON IS AN ALREADY ESTABLISHED FACILITY. Those that are currently employed at General Iron will still be employed at the new site. This means that General Iron will produce FEW IF ANY NEW JOBS for our community. ABOVE ALL ELSE, this relocation serves as an extreme injustice, affecting the most vulnerable populations. Residents living within one mile of the new site will be Latino, under the age of 18, and over the age of 65, and a female-headed household with children present. Why should what is not good enough for the upper class residents of Lincoln Park be good enough for the residents of the Southeast side? Sign this petition to keep General Iron out of our community! The Cook County Department of Environment and Sustainability manages environmental regulatory programs in the areas of air quality, solid waste, and asbestos. Conducting about 8,000 inspections per year, the Department is the environmental protection “boots on the ground” for suburban Cook County. Our main offices (and this position) are in downtown Chicago, and an air quality monitoring laboratory is located in the western suburbs. The Department also coordinates sustainability programs such as energy efficiency, waste reduction and renewable energy for County government offices and for businesses and residents in Cook County. This position supervises engineers and inspectors in inspection of businesses for air emissions under County, State and Federal environmental regulatory codes. Schedules work, manages annual permitting and billing process, tracks performance. Reviews equipment installation permits. Trains staff and provides information on environmental issues to businesses and the public. Coordinates process of administrative hearings for infractions. Prepares analyses and reports. Assists with automation of processes. Coordinates with outside entities such as Illinois Environmental Protection Agency, local municipalities, and other County Departments. Occasionally engages in special projects such as best practices research, writing of ordinances, etc. Knowledge of or ability to learn Federal, State and County laws regulating environmental protection. Analytical skills. Skill in communicating both verbally and in writing with a variety of audiences, including businesses, local government officials and the public. Proficiency with Microsoft Office suite including Excel, Word and Powerpoint. Experience with databases a plus. Minimum: Bachelor’s Degree plus at least two years relevant professional work experience. Preferred: Master’s Degree plus five years relevant professional work experience including significant supervisory or managerial experience. This work will require moderate travel throughout Cook County for which employee must provide own transportation. 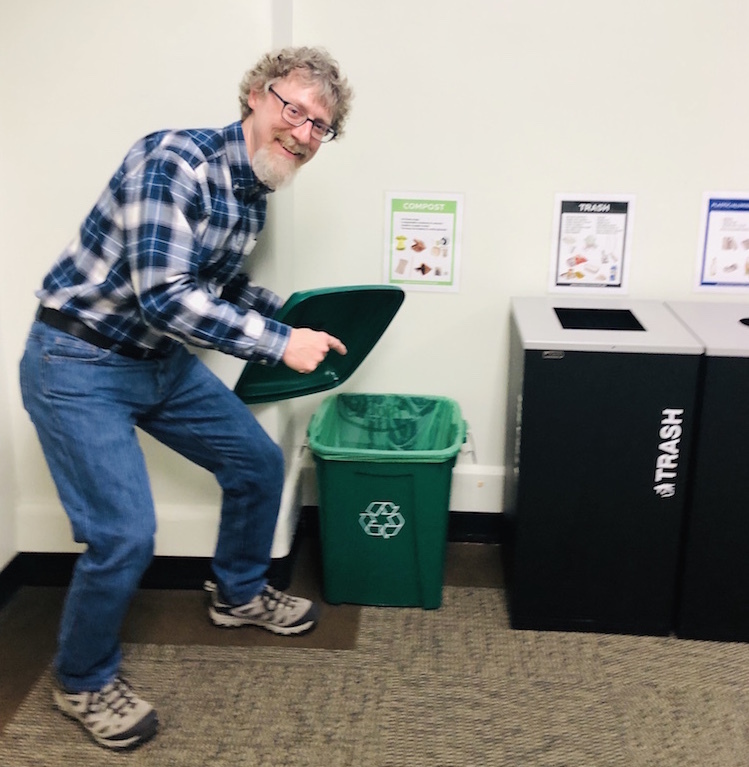 If you haven’t noticed already, here at Roosevelt we have launched a new system for composting food scraps and biodegradable waste. Just in time for spring and the advent of Earth Month, magical green bins have appeared underneath new signage since students and faculty have returned from spring break! Members of the RU community can now officially compost anything that was once alive by placing it into these bins. Whether or not you know much about composting, just take note of this: any organic matter can be placed into these bins. Unlike a small-scale composting operation, you can put meat and dairy into these bins as long as there is no liquid. All food items from the Dining Center, can be thrown away in the green bins (including your container)! The ultimate goal of composting is to divert unnecessary items from ending up in landfills. A large percentage of the solid waste produced at RU, which students in the SUST program have demonstrated in previous waste audits, is food/biodegradable material which could’ve been composted. 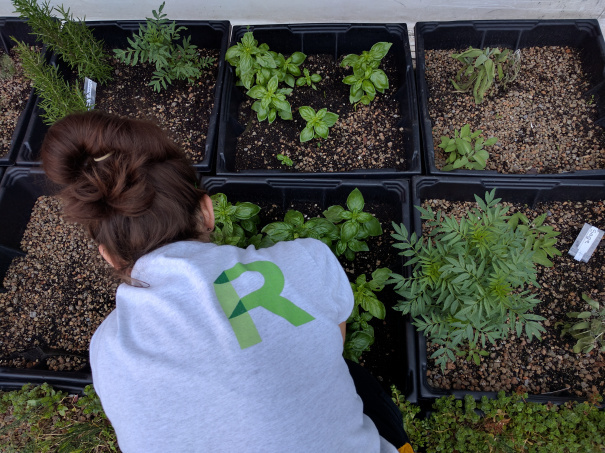 Composting is a natural decomposition process that produces healthy, rich soil, which in turn can be used to enrich our WB Rooftop and Schaumburg Campus Community Gardens. In other words, composting isn’t just less wasteful, it’s also environmentally beneficial. In contrast, landfills emit greenhouse gases such as methane (which contribute to global warming) as well as toxic leachate, which can contaminate ground water resources. The less we add to landfills, the better. 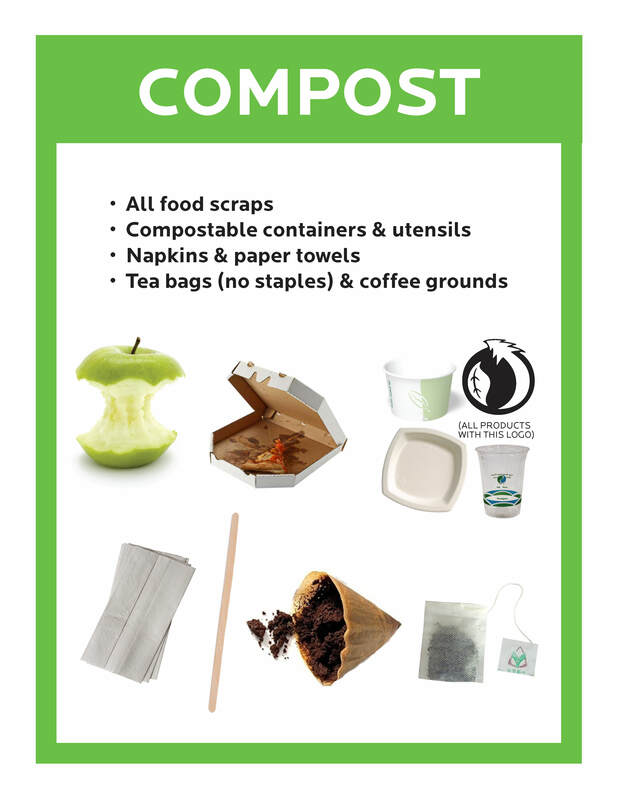 While many items that cannot be placed into a composting or recycling bin will end up in a landfill, the less we consume non-compostable, non-recyclable items, the less waste we create as individuals, which in turn reduces our institution’s overall carbon footprint. Now just as importantly, what should you not put into the Composting bins? Happy composting! And if you have questions about RU’s new waste reduction system, just send an email to greencampus@roosevelt.edu — you can also check this FAQ page at InsideRoosevelt. Margaret Allen is a senior SUST major from Mokena IL who currently lives on Chicago’s SW Side. 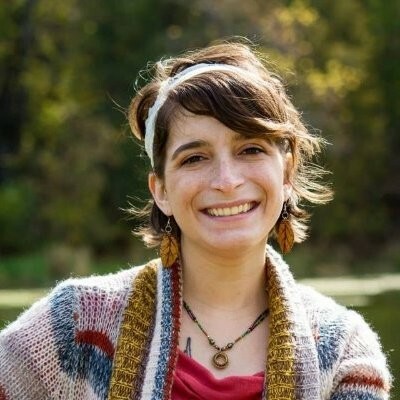 She is working this semester as a Sustainability Studies Associate in the College of Arts and Sciences.